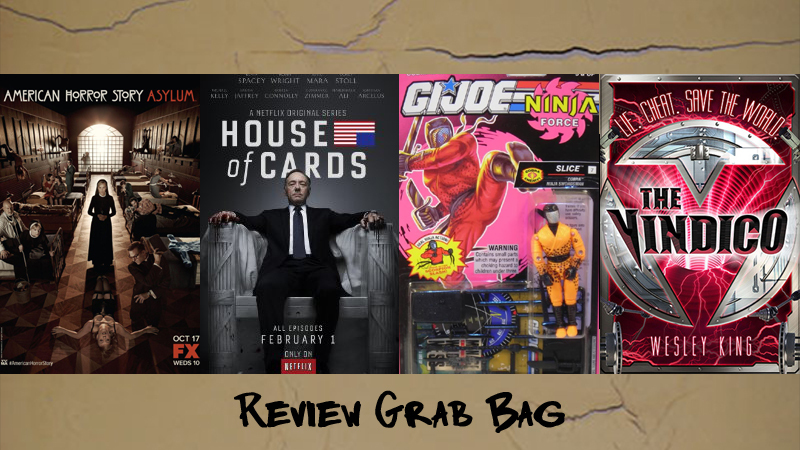 Time for another Review Grab Bag, full of stuff I just don’t have 2000+ words to describe. This month, we’ve got Envelope-pushing TV, Envelope-Pushing Streaming Video, an abomination of a toy from 1991, and a young adult novel about teens kidnapped by super-villains who are then forced to become super-villains. Now that’s variety, ladies and gentlemen. This is the second season of FX’s American Horror Story, which (as far as I know) is about the best horror/suspense show on TV at the moment. 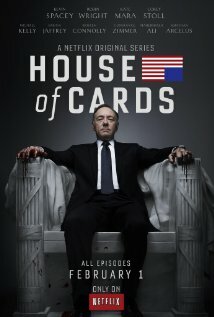 The first season of this show was fantastic, and kept me thoroughly involved for the better part of the entire season. The second season starts out incredibly strong, with a terrific and terrifying setting, and another fantastic group of characters. Unfortunately, it flounders a bit mid-way, but stays frightening and entertaining. At least, it does until the last 5 episodes or so, where it almost completely loses me. By the 10th episode of the season, I was ready to give up on it, and did for a while. House of Cards is interesting on a few levels. It’s a Netflix original series, the first home grown, in America, from the digital distributor. It’s a clever political thriller, with a fantastic cast headed by Kevin Spacey. While Spacey’s Frank Underwood is clearly, deservedly, the star, he’s surrounded by an incredibly strong supporting cast including Princess Buttercup, the “virgin” from Cabin in the Woods, and American Horror Story alum, Kate Mara. Two of my favourite performances in the series come from Michael Kelly and Corey Stoll, as Spacey’s lapdog and congressional puppet, respectively. Stoll is absolutely fantastic as a conflicted congressman, always wanting to “do the right thing” but never having the courage. Once again, no one needs to ask what decade this shining piece of toy history comes from. In 1992 Pink packaging didn’t mean Breast Cancer Awareness… it was just another shade of EXTREME. Grasping for relevance, Hasbro released the G.I. 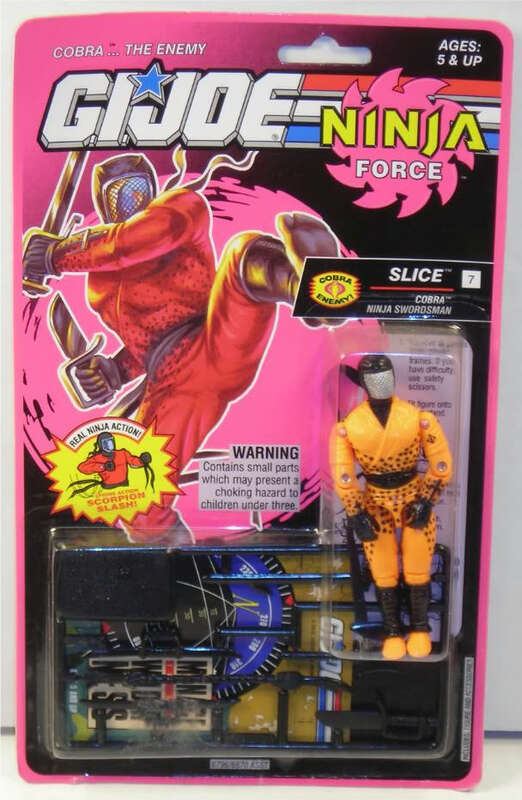 Joe NINJA Force in ’92… because the timeless rule of thumb is this: If you need to sell more of something to a young boy, put some more goddamn Ninjas in it. This is Slice. You’ll never forget his name, because he’s bright goddamn orange. He’s Orange Slice. I found one of him at a thrift store last week, and instantly remembered him. 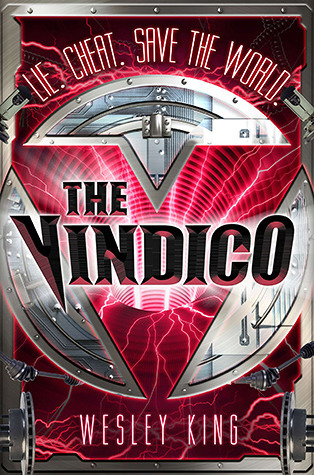 The Vindico is a young adult novel about some teens that are kidnapped by super-villains. The super-villains want to turn the kids into super-villains too, so that they’ll have the numbers to compete against the mysterious League of Heroes. Are they heroes? Who are the villains? The book is an easy read, and the story is enjoyable, though entirely unoriginal. I went into it knowing I was very clearly too old for it, but I’m a sucker for a good superhuman story with shades-of-grey morality questions thrown in. Thirteen-Year-Old me would have loved the living daylights out of this book. Thirty-Three-Year-Old me… not so much. But rating it with the target audience in mind gives it a pretty strong 3/5. Chrissy and I stalled out on AHS:A about halfway through. Just the other day we were deciding to try to pick it back up again, and it’s good to hear it picks back up. AHS:A never gets as good as those first couple episodes, but almost every episode has it’s moments. I’d recommend finishing it if you were enjoying it, and just lost track of it due to time, or whatever. If you thought there was a quality drop, though, I wouldn’t bother. The Quinto reveal was probably the high-water mark of the season. I think it just got to be a little “too much”. It seemed like they kept adding new plotlines but never merged or resolved anything. We’ll get to finishing it eventually.